Rally dos Sertões: Paulo Gonçalves clinches victory in SS04 - the longest stage. 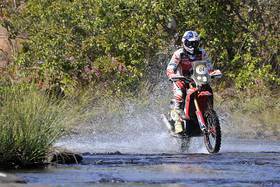 The Brazilian "Rally dos Sertoes" arrives at its mid-point with the race’s longest timed special, in a stage run over a variety of different types of track, amidst the distinctive reddish hue of the Brazilian terrain. Wednesday’s 4th stage, with a total of 363.85 kilometers, set off from Paracatu. Once the 125 kilometer link had been passed, it was pedal to the metal in the timed section - a very well-rounded special that included a narrow, hard and damaged track, that had been at the mercy of the rain and elements. The route also took in a fair amount of sand, as well as creeks and fords of varying water levels. The riders arrived in the town of San Francisco after a ferry-crossing, on the river bearing the same name; thus completing a total stage distance of 585.30 kilometers. 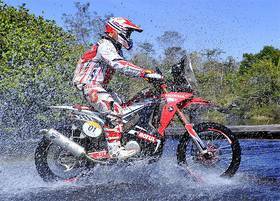 It was first and third place for the two Honda CRF450 Rally riders, and the third time that Paulo Goncalves has marked the best time in a special so far. The Portuguese rider’s aim was clear - nothing less than victory – and not even a slight time-consuming error was able to dent the Honda rider’s continual will to win. 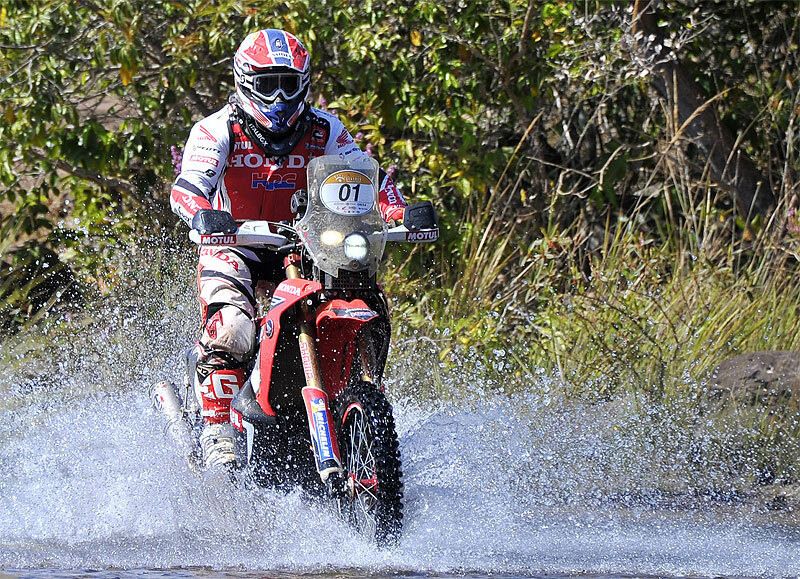 In doing so, Goncalves cuts down the deficit with the leader by 1 minute 15 seconds leaving the Honda rider just two minutes adrift of Marc Coma. "I had a great day today," said Goncalves. "I started from third place and I started to really push. Towards the middle of the stage I made a slight mistake, I momentarily lost concentration and lost a bit of time. I really forced it on the last part and made up time and won the stage. 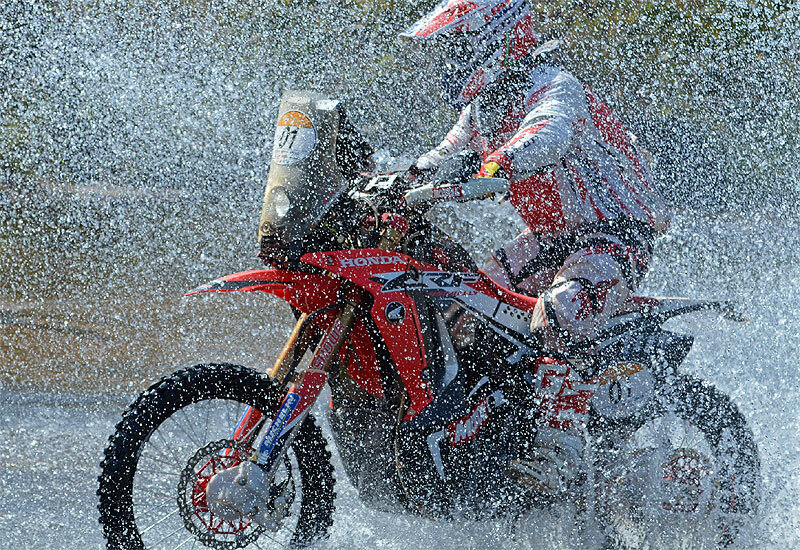 I’m really pleased for me, for the CRF450 Rally and for all the rest of the HRC Team, which is doing a great job. We will continue to work hard over the next few days, as we are now at the half-way point." Helder Rodrigues performed well, taking third place and moving in on third place Brazilian Jean Azevedo, from the Honda Brazil team, who crossed the line in fourth on the day. 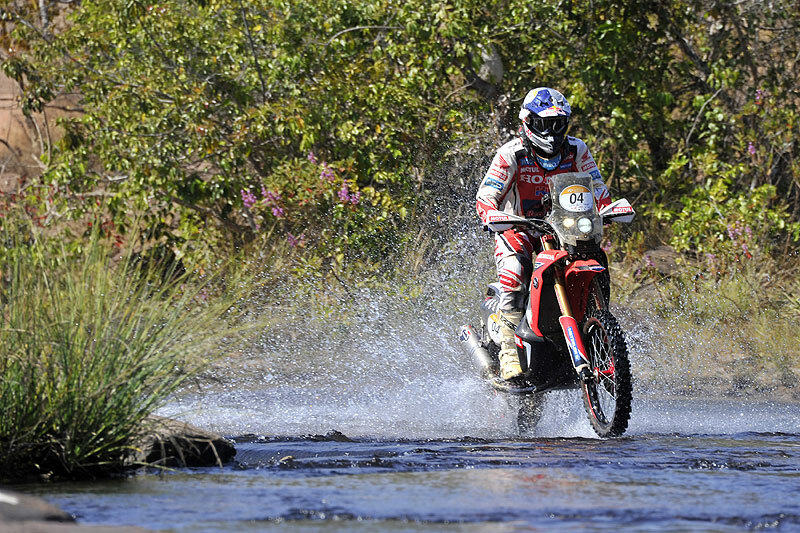 "Today was a very long stage with rocks, sand and hard ground... navigation and everything. It was a long day for everybody. I pushed as hard as I could and set a good pace; I had lost a bit of time at the beginning, but I kept trying to push and managed to maintain a fairly fast speed in the final part," Rodrigues said. Team HRC Team Manager Wolfgang Fischer said about the day: "The HRC Team finished the longest special of the rally. Paul was able to finish the day with a win, and Helder too, was on the podium in third place. Both are fighting to improve their positions. Helder is close to the podium and Paulo too, is looking for victory. There are three days left and we hope to get a good result. The bike is running well, and the riders and the mechanics too. Everything is in good shape." "Tonight the mechanics will have a lot of work to do. They will be concentrating on the bikes that will have to be ready for the two days of the marathon stage that await. That means that from tomorrow, until the day after tomorrow, it will be forbidden for the mechanics to help. 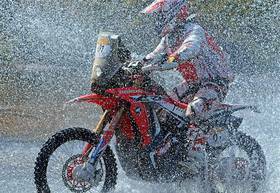 The riders will be alone in the camp, and the bikes in the parc fermé without the mechanics."